Boat covers help protect your boat in wet and dry storage scenarios- an inexpensive option as opposed to custom-fitted boat covers (Source). The boat covers we examined come in different sizes and include buckle straps and elastic hems to help custom-fit it to your particular vessel (Source). ​Buyers advise that you might need to replace these boat covers after several years of use. Especially if they are routinely exposed to harsh, outdoor weather, as opposed to dry storage (Source). 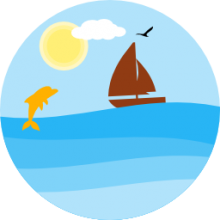 Buyers use them ​for mooring as well as seasonal storage, helping shield the boat exterior from UV-light damage and the interior from inclement weather (and even pesky wildlife!) (Source). Buyers who have purchased boat covers advise employing boat ﻿﻿support pole﻿﻿s if you're concerned about rainwater and snow pooling on the cover and leaking through to your boat's interior (Source). The MSC Waterproof boat cover is our top pick because it's received the most solid feedback from its user base of the 5 we examined. One buyer told us that over 6" of snow piled on top of it during a snowstorm and it didn't allow a leak or tear under the weight. Another reviewer stretched it over his existing, worn-out boat cover, providing a double-layer of protection for his prized Grady White during a Long Island, New York winter. You can vet the different sizes on the product page. Another reviewer was surprised at how well the boat cover traveled- he hooked it up to his trailer, strapped it down securely- and not a problem. There have been some buyers who complained that the seams tore after mild outdoor use- but they were the minority. It does include a 3 year manufacturer's warranty- so if you experience problems with it, you do have some recourse. This waterproof boat cover offered by MSC is a good option for someone who needs a heavy duty boat cover. Users love the quality of the material and functionality of the item, but some do complain about the product not lasting too long. This product is designed for long-term storage, mooring, and highway travel and is resistant to mildew and UV damage. It is made of marine grade polyester canvas with double PU coating. It features adjustable straps and storage bag. It comes in 4 colors: beige, forest green, navy, and pacific blue. This full-size waterproof boat cover seems like a good choice if you are looking for a good quality boat cover that fits great. The general user consensus concerning the MSC polyester canvas boat cover is that it fits great and that the material seems to be of good quality (thick enough to do the job of protecting the top side of the boat and at the same time not too bulky to allow easy handling). Users love that the package includes a storage bag and quick release buckles for the tie-downs. One satisfied purchaser states that the elastic waist holds the boat cover tight to the hull and makes putting it on an easy one-man job. However, some buyers complain about the longevity of the product, saying that it is priced right but is a disposable item after a year or two. One dissatisfied purchaser complains about the lack of true waterproof features and the fact that the seams ripped off after a month of use. This fishing ski cover offered by Brightent-Boat covers is a solid option for someone who needs a heavy duty boat cover. Users agree that it is a nice cover for the money, but do complain about the quality of the material. This product is made of a very good waterproof material –600D woven polyester material with PU coating. It features an 18-meter extra belt, which is great because you can use it to tighten the cover from the front to rear of the boat. It is available in three sizes, depending on the boat length and beam. This three-size waterproof boat cover might be a solid choice if you are looking for an inexpensive boat cover that fits perfectly. In general, users have a favorable opinion of the Brightent-Boat fishing ski cover, saying that it fits great, keeps water out and is easy to use. They feel it is a nice cover for the money. One happy purchaser says that the elastic around the edges is a perfect feature that helps to secure the cover. However, some buyers complain about the quality of the material, which seems a bit thin and not long-lasting. One buyer shares that his cover faded in the sun and therefore advises spending a few extra dollars and getting a better quality UV coated cover. Another one states that the item is waterproof only to a degree. 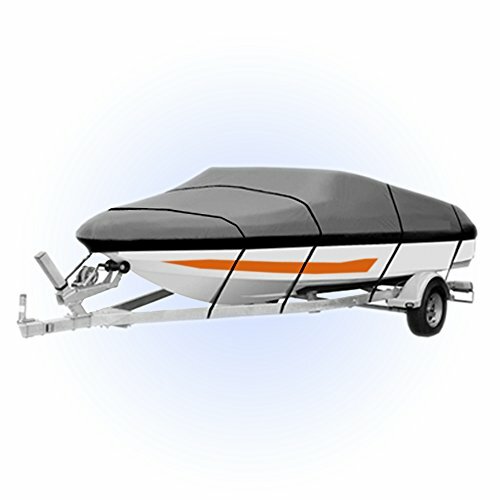 This ski boat cover offered by Yescom is a solid option for those who need a V-hull boat cover. Users like that it is affordable and that it fits the boat well, but some do complain about the poor quality of the fabric. This product offers great protection for your boat. It is made of mildew-resistant and UV-coated fabric that will not shrink or stretch with use. It is available in 3 colors: blue, grey and green. 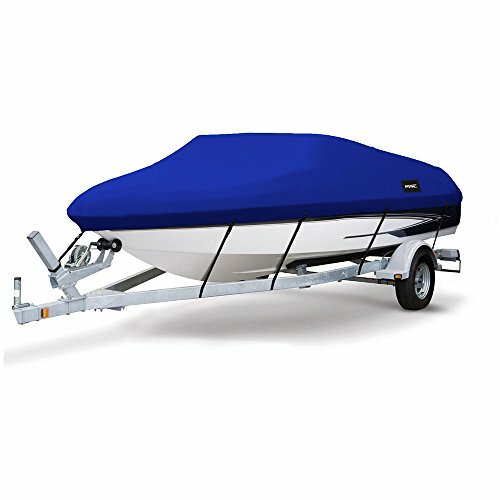 If you are looking for a boat cover with a quick-release buckle and strap system which will offer a secure fit for taking your boat on the road, this waterproof boat cover might be a good option. In general, users have a favorable opinion of this boat cover and they state it fits a boat well and tight. They like that the item is affordable, well-made and of solid material for the price. However, several purchasers are dissatisfied with the quality of the material and durability of the product. One of them states that the boat cover ripped in the first storm, while another one shares that it ripped apart in his hands after less than 6 months. If you are looking for an all-weather suitable boat cover, you might want to consider this V-hull boat cover. Users like the quality of the fabric and how well the cover fits a boat, but one does complain about the size he ordered being too small. This product is a trailer fishing ski cover that is available in 4 sizes. The smallest size fits a 14’-16’ long boat, two medium sizes fit a 17’-19’ and 20’-22’ boat and the largest size is suitable for a boat of 22’-24’ length.This boat cover could be a solid choice if you are looking for something to keep your boat dry and clean. In general, buyers are satisfied with the quality and good fit of this boat cover. One satisfied user says that the product covers the engine headers and hull completely. Another one states that it is very easy to put on. However, one buyer complains about the size he ordered, stating that it is too small for a 21’ boat. If you are looking for a top-rated boat cover, you might want to consider this fishing runabout outdoor protector offered by RockyMRanger-Boat covers. Users love its quality and functionality, but some do complain about it being too big. This product fits a 17′-19′ straight length between front and rear point and 95” beam width across the widest point of the boat. It is made of breathable and water repellent polyester material. It features high-quality tie-down straps which are great for securing the cover in place for storage or travel. If you are looking for a universal size boat cover, this might be a good option. In general, users have a favorable opinion of this RockyMRanger-Boat universal boat cover, and they praise it saying that you get an outstanding cover at a great price. One user shares that the material is durable but lightweight, which makes the cover easy to install. Another one adds that the stitching is excellent and the buckle/strap/loop tie-down system is very stout. However, some buyers complain about the cover being a little baggy and not fitting properly. One dissatisfied purchaser expresses worries about the extra fabric. The first boat cover we took a look at is the MSC heavy-duty waterproof boat cover. It comes in pacific blue, navy, forest green and beige, manufactured from a polyester canvas material that is certified marine-grade. It also comes in several different sizes: 14 feet to 16 feet with beam widths between 68 inches and 90 inches. A 16 foot to 18.5-foot option fitting beams up to 94 inches- and the sizes gradate up from there- so it's recommended to research the product specifications as well as take careful measurements of your boat to make sure it's a good fit. It ships with adjustable straps that include quick-releasing buckles and an elastic cord that is sewn into the cover's hem so that you can tightly customize the boat cover's fit to your water-faring vessel. One buyer observed that the boat cover does not have vents but they do say it's able to travel with the cover on, not just used it only when it is situated in storage. Some buyers opted to purchase this adjustable-sized boat cover, in comparison to a T-top boat cover, rather than get a more expensive custom-fitted option. Many were impressed, saying that the quality was better than they expected and it enabled them to discover a tight fit for their fishing and deck boats. However, one reviewer was unimpressed, saying that because of his boat's design, the boat cover has a tendency to collect pools of rainwater that then leak into the boat. For that reason, reviewers say they don't consider it an especially waterproof option. As well as some buyers notice that its seams started splitting, saying it didn't last one single storage season. However, other buyers had better results, saying that it has not ripped or torn even after ice and snow several inches thick lay on it for weeks at a time. Another reviewer employs it as a mooring boat cover, saying that the material has been water resistant for a couple of months as well noting that the included straps are more applicable to dry storage purposes than to mooring ones. The second option we examined is the waterproof Brightent Boat Cover. It comes in three different sizes: 14 feet to 16 feet, 17 feet to 19 feet, and 20 feet to 22 feet. This polyester, marine-grade, boat cover employs an 18-meter belt that straps from the rear to the front, helping you to secure the cover and keep it tight and waterproof, whether you are doing dry storage or mooring it in your dock. Buyers say that if you're looking for an outboard motor cover you'll have to purchase that separately. One buyer used it on his Bass Champion center console boat that measures nearly 18 feet long- this fisherman told us that he was duly impressed by the quality of its construction as well as the material used to create its cover fabric. This fisherman used the strapping, tightening it down and then cutting off the edges before burning them with a lighter so that they didn't fray. As well, he recommends using some support poles to help ensure that rainwater doesn't pool on the boat tarp cover. Another reviewer uses them on his ski boat, saying that in his experience they are completely waterproof, the straps are incredibly strong, and their buckles are built from a solid plastic that has a tough feel to them. Since he owns a V-bottom boat that has a relatively large windshield and trolling motor, he was pleasantly surprised at how easily the cover completely engulfed his boat without him having to do a lot of struggling to stretch it out. Another buyer who owns a 23 foot Bayliner says that rainwater beads on the cover, drying fast, and preventing any leaks into his boat's interior. He does note that because his jet boat does have a swimming platform on the back, he can't quite stretch the cover over in that corner. The third V-hull trailerable waterproof boat cover we examined is the Yescom option- it's built in the USA from oxford cloth and ships with 17.5 m ropes for tying down and is designed to be UV and mildew resistant, fitting boats that measure 16 inches to 18 inches. This particular option has received mixed feedback, with some reviewers criticizing its ability to resist harsh weather conditions including the sun and the wind. Indeed other reviewers have echoed the sentiment, saying that overall they found that it didn't last more than a single season. The fourth boat cover we looked at is the all-weather U-max option. Again, we discovered mixed feedback from its user base, with some criticizing it for being too small, though it does ship in a variety of different sizes, so you might be able to find a fit if you decide to purchase it. Buyers say that it will not fit over a wake tower, however. The last option we examined is the RockyMRanger boat cover. It's designed to protect your boat's exterior from harmful UV rays in inclement weather while keeping the boat interior dry and clean whether you are mooring it for the day or are putting it in dry storage in your driveway during the winter. The manufacturers indicated, as we have seen other users say as well, that you want to assemble a stander pole or some sort of frame to help support the boat cover if it is going to be inundated with heavy amounts of snow or rain. Using a support pole, on the cover will be lifted and slopes so that water and ice will just run off it rather than pooling and potentially destroying the cover and seeping into the interior of your boat. A ski boat owner says that the bay boat cover helps to keep wildlife, including feral cats, from nesting in at during the winter months. One buyer says he provided a good fit for his bottle-decked jet boat, covering the entire hull, including the high-rise intake engine and through the transom exhaust. 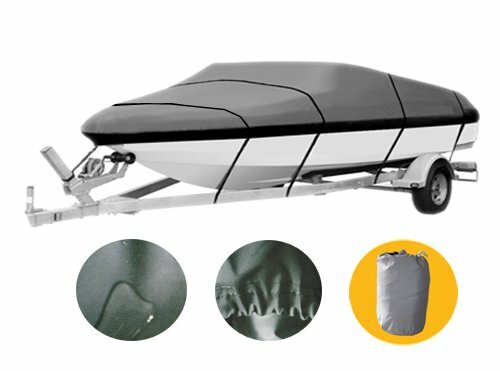 When you garage it, reviewers say that its elastic cord that is sewn around the full perimeter of the boat cover's bottom is equipped to provide a tight fit.